Sneak peak #8: SWIM! It’s trawling!!! Welcome to the 8th addition of our thread of blog posts! Every week, get a ‚Sneak Peak‘ into our scientific stories our team is now finalizing. We share a little excerpt from one of the stories and chat with the authors about the inspiration and motivation for their story. This week, we talked to our team member and scientist Haozhuang Wang , about his story „SWIM! It’s trawling !!!“. I started to study cold-water corals (CWC) as my PhD project started in 2015. The more I learned about CWC, the more I became surprised and intrigued by these creatures. In comparison to tropical corals, CWCs are not well known to the public and our knowledge about them in the scientific community is also limited. Despite this, they are already being under threat by human’s activities, especially by deep-sea trawling. Every time when I see pictures of reefs, either damaged or covered by garbage, I have a strong urge to tell people that we need to protect these deep-sea creatures. So eventually, this short story came out. The story portrays the beautiful reef city and the varied animal’s species living among it. 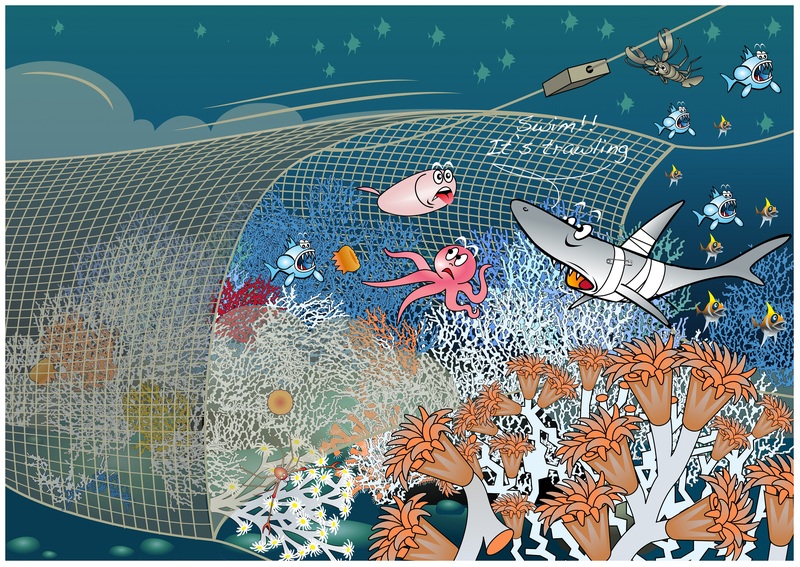 One day, a newly born CWC larva, Mandi, and his friend a velvet belly shark happen to witness the whole reef city being destroyed by deep-sea trawling. To know more what happened to them after the trawling I invite you to read my story and find how destructive trawling can be. Check back with the blog and @OUAT_sci_story on Twitter for our next ‚Sneak Peak‘!